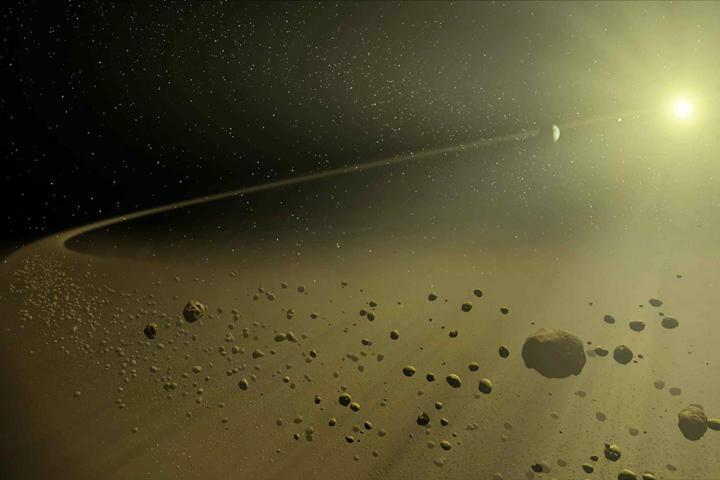 CAMBRIDGE, MASS.–As part of an effort to identify distant planets hospitable to life, NASA has established a crowdsourcing project in which volunteers search telescopic images for evidence of debris disks around stars, which are good indicators of exoplanets. Using the results of that project, researchers at MIT have now trained a machine-learning system to search for debris disks itself. The scale of the search demands automation: There are nearly 750 million possible light sources in the data accumulated through NASA's Wide-Field Infrared Survey Explorer (WISE) mission alone. The work represents an unusual approach to machine learning, which has been championed by one of the paper's coauthors, Victor Pankratius, a principal research scientist at MIT's Haystack Observatory. Typically, a machine-learning system will comb through a wealth of training data, looking for consistent correlations between features of the data and some label applied by a human analyst – in this case, stars circled by debris disks. "The main vision is to go beyond what A.I. is focusing on today," Pankratius says. "Today, we're collecting data, and we're trying to find features in the data. You end up with billions and billions of features. So what are you doing with them? What you want to know as a scientist is not that the computer tells you that certain pixels are certain features. You want to know 'Oh, this is a physically relevant thing, and here are the physics parameters of the thing.'" For her final project, Tam Nguyen, a graduate student in aeronautics and astronautics, chose the problem of training a machine-learning system to identify debris disks, and the new paper is an outgrowth of that work. Nguyen is first author on the paper, and she's joined by Seager, Pankratius, and Laura Eckman, an undergraduate majoring in electrical engineering and computer science. In addition to the tagged debris disks from NASA's crowdsourcing project, the researchers also had a short list of stars that astronomers had identified as probably hosting exoplanets. From that information, their system also inferred characteristics of debris disks that were correlated with the presence of exoplanets, to select the 367 candidates for further study.